I am not one for fancy desserts that require a lot of fiddling with, and I really prefer rustic fruit tarts, or simple cakes that can be enjoyed from breakfast right through dinner just like this one. 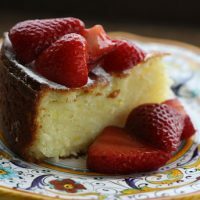 I have had this easy recipe for a very moist Lemon Ricotta Cake in my files for quite a while, and although I have made it a number of times in the past, I just recently realized that I have never shared it. This is a lovely cake as the ricotta keeps the cake nice and moist and it has just enough lemon flavor to keep it from being at all boring. Because it is a fairly basic cake though, you do do a lot with it. It is wonderful glazed with a light lemon glaze, or served sliced with a scoop full of macerated berries, or other fruit on top which is how I prefer to serve it. This cake will keep at room temperature well wrapped for two days, but if you are keeping it longer, or if your kitchen is warm I’d store it in the refrigerator. The texture does become a little more dense once it has been refrigerated, but it is just as delicious. I am very lucky living here in Umbria that I can buy freshly made sheep’s milk ricotta cheese as well as organic lemons from the Amalfi coast, but any good quality full fat ricotta cheese will work just fine. If your ricotta seems very wet, simply place it in a sieve over a bowl to remove excess liquid for 30 minutes or so. Use unwaxed lemons for the best flavor. 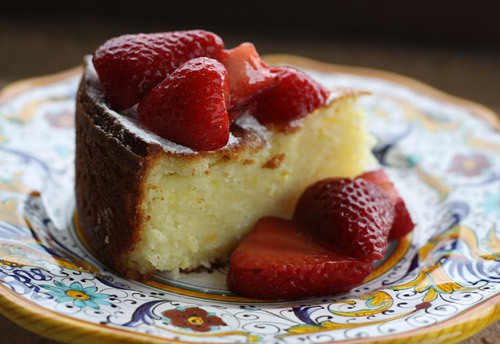 A simple lemon flavored cake that includes ricotta cheese, keeping the cake ver moist. Lightly grease and flour a 7 or 8 inch spring-form pan. Beat the butter and sugar with a hand mixer until light and fluffy. Add the lemon zest, extract, egg yolks and ricotta cheese and beat until smooth. Mix together the flour, baking powder and salt, and beat into the butter mixture just until combined. Wash your beaters well, and then beat the egg whites in a separate bowl until stiff. Gently fold the egg whites into the batter then spoon the batter into your prepared tin. Bake for about 45 minutes, or until a cake tester stuck into the center comes out clean.